This past Saturday (January 16, 2016), I visited The Brush Art Gallery & Studios at 256 Market St. in Lowell for a panel discussion on “The Roots of ‘The Brush’ & Lowell’s Cultural Revival” which featured Paul Marion. Rosemary Noon, Fred Faust, and Susan Kapuscinski Gaylord who were all “present at the creation” of the Brush 35 years ago in the midst of the Lowell cultural revival of the 1970s and 1980s. The Lowell Art Association, founded in 1878, was the first organized group of artists in the country. Previously artists all worked as independent actors. Paul pointed out that the Brush has always been housed in a building leased by the U.S. Dept. of the Interior (Lowell Historic Preservation Commission and Lowell National Historical Park) and drew parallels between artists doing landscape paintings in what became Yellowstone National Park out west in the 1870s with other artists doing landscape/cityscape paintings of Lowell’s mile of mills as early as the 1820s. He reminded us that Lowell had been a visitor attraction for 50 years before the first national park at Yellowstone and that by the 1870s a “parade of painters” had already been drawn to the factory scenes found here. Susan recalled the pre-Brush Gallery days in Lowell. At an “Expo ‘79” arts festival organized by the local CityFair federal arts jobs project, sponsored by Pat Mogan’s Human Services Corporation and funded by Lowell’s CETA (Comprehensive Employment and Training Act) program, Susan met a number of artists who soon joined together in an organization they called “Art Alive!” At the time, the National Park had acquired Old City Hall on Merrimack Street, the building that now houses the headquarters of Enterprise Bank. NPS also acquired the neighboring building, known as Solomon’s Fabric Store, which stood on the parking lot now next to the Enterprise Bank. Because NPS did not have any immediate plans for the Solomon Fabrics first floor, it provided office space in the rear to the Human Services Corporation and window and floor space in the front to Art Alive! Putting this in historical context, Susan explained that in the late 1970s, the goal of many artists was to have a solo gallery. Art Alive! was a communal effort organized by a group of artists working in concert. Susan said they saw themselves as a younger, cooler, hipper alternative to the Lowell Art Association. Art Alive! and its gallery “was not strictly structured” and had a “rough and tumble management style,” but they all worked together for the common good. Susan believes that group ethic helped give rise to the Brush Gallery which is a collection of individual artist studios, all open to the public. Fred Faust was the next to speak. After observing that “there is something intrinsic in all of us to do art,” Fred explained the genesis of The Brush. Although not a native of Lowell, he was here working as a news reporter at radio station WCAP when Paul Tsongas hired him to be on his congressional staff. Fred said that all of the “big red brick buildings here in Lowell” struck him as a very important part of American history, so he asked to be assigned to Washington, D. C., to work on the legislation to create a national park in Lowell. Fred chose to live across the Potomac River in Alexandria, Virginia. In his free time, he walked around that old city and discovered a thriving art community in an old torpedo factory on the riverbank. Seeing 50 or more artists capturing the post-industrial settings in their art fascinated him. At the same time back in Lowell, Pat Mogan was vigorously lobbying for art to play an important part in Lowell National Historical Park. After the legislation creating the park was enacted, Fred returned to Lowell to serve as the director of the Lowell Historic Preservation Commission. When it came time to address the Market Mills complex, both the city and the developer wanted it to be all housing, but Fred and others negotiated a deal that placed the national park visitor center on the ground floor of one building, a food court called The Melting Pot in another (the space currently occupied by Lowell Telecommunications), and a space for artists in the third. They also substituted red-brick pavers for the asphalt that was supposed to surface the courtyard. Rosemary Noon spoke next. She was hired by Fred in 1983 to be a project manager of the Historic Preservation Commission, working there until 1987. She recalled her first day when she accompanied her then-supervisor Jim St. Clair to the Brush space to mediate a dispute between two artists. Rosemary observed that to be successful, artists need a “strong nature,” but this is not conducive to working as part of a group. She said the long success of the Brush is a testament to how its artists have been able to work collaboratively for so long. The Historic Preservation Commission had a legislatively-fixed lifespan so “the specter of its sunset” always was a concern. When it was about to end its first ten years, a 501c(3) corporation was established so artists could get grants for administrative purposes. At the time, Lowell was getting a name as an arts center, due partly to the public art collection that was being installed at the time. Fred then commented that they wanted the artist studios to be open to the public at set times. Artists don’t necessarily like that but because it was federal money, we had leverage to force it. That’s how we justified spending the money with the feds. 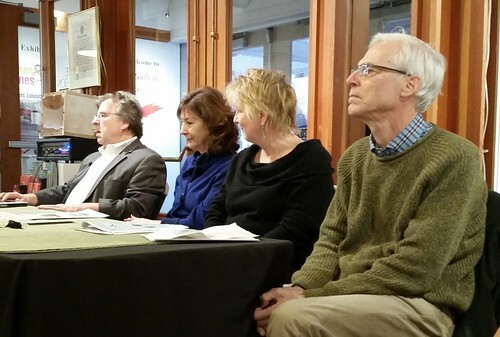 The panel asked audience member Bill Tourville, the architect who designed the space, to share some comments. He said coming back today, he’s amazed that the artists in The Brush have removed the doors to their spaces. He said the artists at the Brush are very adventurous and he finds the interaction between the artists and the community to be fascinating. The panel also asked Bernie Petruzziello to speak. Bernie was born in Boston’s North End and came to Lowell to live. There were few artists here then. Coming from the North End and its crowded streets, this was much more open. In 1965, I would walk around sketching and thought this would be a perfect place for artists. He is happy that it came true. He said Pat Mogan pushed for artists. Bernie said “I cannot believe what has happened in this city; it’s a wonderful place for artists. Gloria Polites, now with LTC, but involved in the cultural community back in the early 1980s (on the staff of the Preservation Commission), recalled all the events held in the Market Mills courtyard as a way to attract people. These included musical performances and antique car displays. Richard Marion, an artist and a member of Art Alive! who had his own Gallery 21 on Hurd Street (1966-1990) explained how artists calling themselves the Lowell Sunday Painters would go various parks in the city to paint outdoors, exhibit their work, and do events for the neighborhood kids. He also commended the role played by Ann Schecter in strengthening the art community in Lowell. Fred picked up on this to say “Those fights aren’t over.” He said the “tear it down” philosophy came from a defeatist attitude held by some in the city. The only antidote for that is to strengthen the community. If 50 people go to a city council meeting and say something is a bad idea, the council is likely to listen. Thanks for a great summary and my appreciation for being invited to this event as organized by Paul Marion and Jim Dyment. It’s good to be able to look back at the roots of the Lowell Renaissance and to remember how far the city and its residents have traveled. Pat Mogan certainly had it right in saying that Lowell’s revitalization was about much more than bricks and mortar. 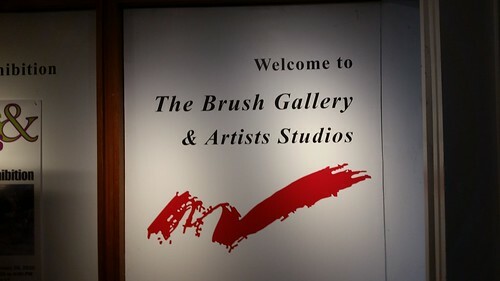 Congratulations to the Brush and all of the contributing artists. Thanks for the great report Richard. It was such fun to be there and see old friends and reminisce. I appreciate that you have chronicled it and that I was invited by Paul Marion to take part..